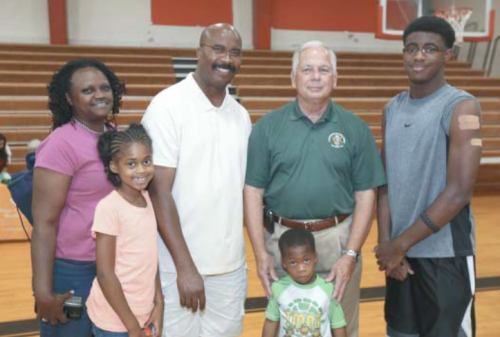 Gene Green visits with Kaii Brume (far right) and his parents Barbra and Friday Brume (left) during the 19th Annual Gene Green Immunization Day. GALENA PARK, Texas – Galena Park ISD hosted the 19th Annual Gene Green Immunization Day at North Shore Senior High School 9th Grade Center on Saturday, August 23, 2014. According to the Harris Health System (formerly Harris County Hospital District), 1,528 vaccines were given to 523 children. In addition, numerous other organizations and groups were on hand to offer information, services, and giveaways, including: free flu shots courtesy of Walgreens; free school supplies and backpacks courtesy of the North Shore Rotary Club; KRBE conducted a live on-site broadcast and gave away promotional items; Texas Children’s Hospital fitted and gave away bicycle helmets; and Santos Ramirez, Galena Park ISD’s Licensed Chemical Dependency Counselor (LCDC), visited with parents and students about drug awareness. Congressman Gene Green, State Representative Ana Hernandez, Constable Chris Diaz, State Representative Armando Walle, and GPISD Superintendent of Schools Dr. Angi Williams showed their support, visiting with parents and children, and encouraging good health and education. “This was a great cooperative effort for our community and students. This event helps give our students the best “shot” at staying healthy so they can come to school and learn,” said Dr. Williams. Approximately 100 volunteers, including GPISD nurses, students, clerical staff and administrators helped make this a successful day for the community.